This session focuses on the balance between metrics and thoughtful donor relationships. It explores what metrics make sense for your particular group and how these much support long-term, artful donor relationships. It also addresses time management and mindset for success issues. 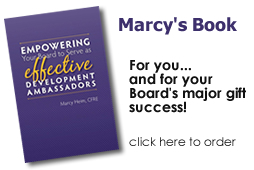 The workshop that inspired Marcy’s book, Empowering Your Board to Serve as Effective Development Ambassadors! Are your board members engaged in your development efforts with enthusiasm or avoidance? Is their role in the development process defined and understood? We know that deep and satisfying donor engagement leads to increased annual and major gifts. This one-day intensive workshop is designed to give board members and other volunteers the tools to help staff create positive and productive relationships with donors and increase giving. We’ll explore why people give, and talk about reasonable expectations for both staff and board members that grow the number and size of gifts received. We will use specific examples, role playing exercises and other tools to enhance your skills and confidence playing a key role in the process. Today’s major gift development manager need to recognize and appreciate the important role that individual mindset plays in maximizing the major gift success of staff. Methods and metrics are simply tools to support the professional who can control and enhance their mindset and virtually attract success with prospective givers. Today’s leadership must be equipped with tools to support, coach and empower staff to challenge the mental barriers to success. In this session we will explore how to incorporate this into your staff management systems. Focus your attention on your prospective giver and explore practical ways to approach someone for the first time, develop a meaningful relationship and make a successful, respectful, artful ask – again and again. 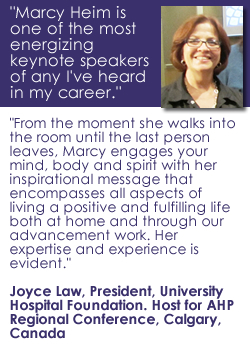 Join Marcy on a journey around an artful cycle of successful relationships. This session will focus on increasing your comfort and success in making the all-important major gift ask for your institution. We will address issues such as timing of the ask, who should ask, what do you say, where do you say it, how much do you ask for and how do you respond to objections. By using specific examples, role play exercises and other tools you will leave this session feeling empowered to have those artful conversations that lead to individual major gift development success. Note: Many of these strategies can be applied to annual fund face-to-face solicitations. Burning Bright Without Burning Out: Balancing Stewardship and Success! When we think about long-term development success we think about long-term respectful relationships with our donors and our colleagues. Every donor is unique and interacts with our organization on an individual timeline and intensity. On the other hand, every organization has expectations and goals that need to be met on a timeline. How can we best shepherd the personal needs and relationships with our donors while still meeting the expectations of our organizations? In this session we will cover three major areas: 1) The long-term ROI of exceptional stewardship and what defines exceptional stewardship, 2) Incorporating stewardship into your organizational timelines, and 3) Communicating “progress” with leadership and creating workable metrics so the science serves the relationship-building process. New to advancement? Is this your first job out of college or your second or third career change? Well, this session is for you! When you are new to advancement work, how do we position ourselves for the greatest productivity and success? What mindset, practices, and communications strategies help us achieve the results we want? Marcy Heim will answer these questions and give you much, much more. Our boards tend to place a great deal of emphasis on results. Your board wants to hear about ROI and low fundraising costs. How do you create an understanding of the long-term nature of major gift development? What do you do if you don’t really even have access to the board to try to deepen their understanding? Perhaps you have leadership gaps and issues to deal with from a campaign, or you are not sure what your own position or credibility is with the board. We will explore three actual case studies where the development professional successfully handled talking to their boards and outline several strategies you can ADAPT to your SPECIFIC SITUATION to help you talk to YOUR board! 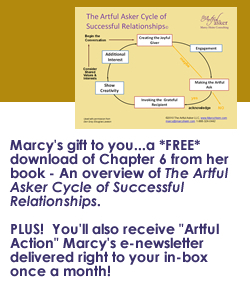 Using Marcy’s Artful Asker Cycle of Successful Relationships™, we will take a journey around the cycle highlighting the action steps for best results along the way. Then we will use interactive sessions to outline specific conversations we can have to create a joyful giver, make an artful ask and be a grateful recipient. Everyone has a Boss – how to get the most success with yours! Ever feel like the new VP, ED, or dean just doesn’t “get it?” Does it feel like your boss has too many responsibilities to really have the time to participate in the development work you are doing? Do you struggle with the evaluation process? Join us to learn techniques to help you get on the same page as your supervisor. Look at ways you can help manage your evaluation process. How do you play the numbers game and also have artful relationships? The M&Ms for Success in Fundraising…and LIFE! This combination session addresses how our success depends upon BOTH our methods and our mindset — the M&Ms for success! Part 1 is a fast‐paced journey around the Artful Asker Cycle of Successful Relationships™ and can include a focus, and one hands‐on exercise, on preparing for a successful, respectful major gift individual ask. Then in Part 2 we look at the role our mindset plays in our overall development success and how we can strengthen our C.O.R.E. in development where CORE represents a series of words and techniques that will increase our overall happiness and rekindle our passion for the amazing and challenging work we do. Participants leave with not only a new mindset, but also an enhanced appreciation for the specific actions they can take to enhance fundraising success. Contact Marcy today by email or call 1-888-324-0442 to learn more.